SignalScope Pro version 4 can uniquely identify USB audio devices attached to iPhone, iPod touch, or iPad, and remember user settings for each device the next time it is connected. Direct support has been added for The Modal Shop’s model 333D01 USB digital accelerometer and miniDSP’s UMIK-1 USB measurement microphone. With the 333D01, SignalScope Pro automatically loads serial number and sensitivity calibration information directly from the device as soon as it is connected. When the UMIK-1 is connected, SignalScope Pro recognizes it and prompts the user for its serial number. Sensitivity calibration and frequency response data for the UMIK-1 can then be downloaded automatically, just by entering the UMIK-1’s serial number. of arbitrary length or frequency resolution. – SignalScope Pro directly supports The Modal Shop’s model 333D01 USB digital accelerometer, and can automatically load serial number and sensitivity calibration information directly from the device. Making calibrated acceleration measurements is as easy as plugging in the 333D01. Factory calibration information is embedded in exported audio files (from the Oscope tool) when data is acquired with the 333D01. 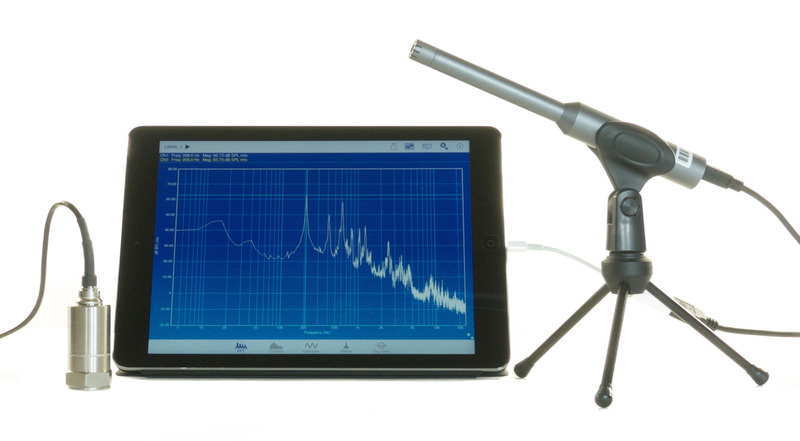 – SignalScope Pro directly supports the miniDSP UMIK-1 USB measurement microphone. Sensitivity calibration and frequency response data for the UMIK-1 can be downloaded automatically, just by entering the UMIK-1’s serial number. Making calibrated sound level measurements is as easy as plugging in the UMIK-1 and typing in its serial number (the serial number only needs to be entered once, after which SignalScope Pro will remember the microphone sensitivity). – Additional dB scales of 3, 6, 12, 15, and 18 dB per div are now supported by the FFT analyzer. Also, when adjusting the dB scale manually, the dB offset will always be set as a multiple of the scale so that 0 dB is always available in the vertical axis labels. – Minor bug fixes and cosmetic enhancements. – Apple’s Lightning to USB Camera Adapter or iPad Camera Connection Kit is required for connecting USB Audio devices to your iPhone, iPod touch, or iPad. – SignalScope Pro 4 requires iOS 7 or later. Similar features have been added to SignalScope 5.0, although select in-app upgrades may be required (available via in-app purchase). Can you tell me what the voltage/load on the iPhone 5?